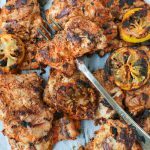 Aleppo pepper chicken: The BEST Grilled Chicken Thighs Recipe! This is the BEST grilled chicken thighs recipe and so easy! 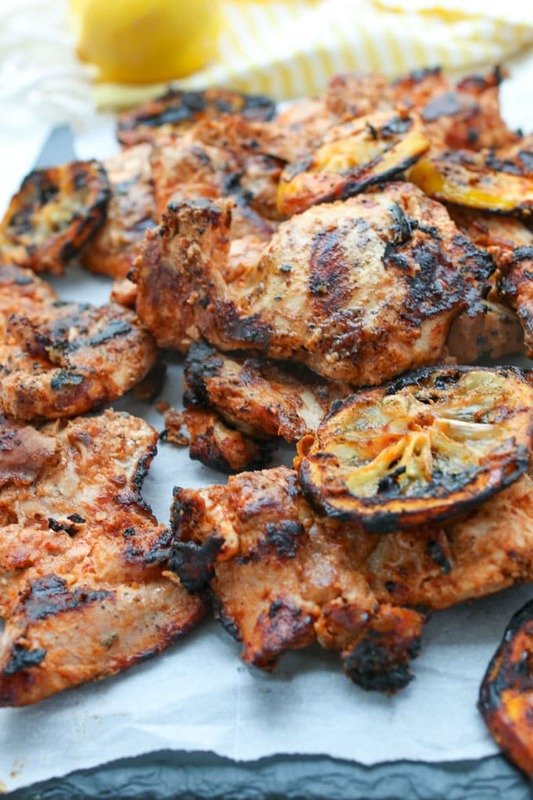 Boneless skinless chicken thighs have never been more tender and full of fantastic flavor. If you can’t find Aleppo pepper, no worries. You can substitute a mixture of crushed red pepper and paprika and it’s equally delicious. Thick Greek yogurt tenderizes the chicken thighs. A smoky pepper and lemon-garlic combination infuses it with intense bright flavor. 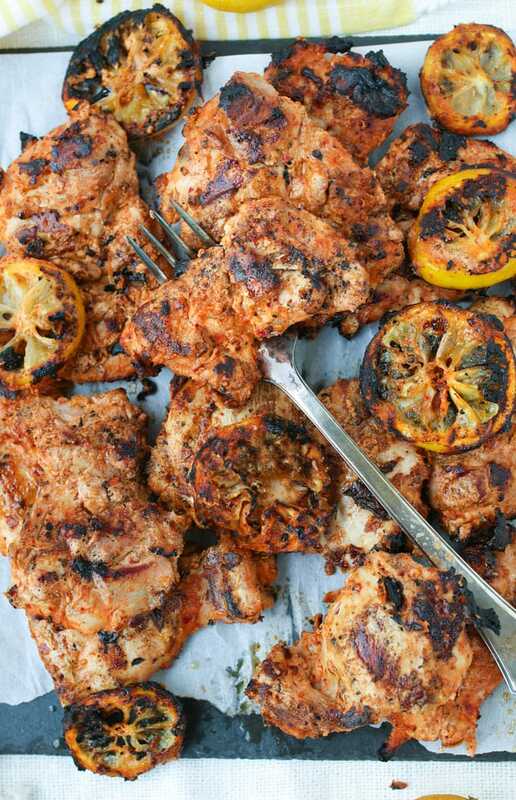 Aleppo pepper chicken comes off the grill golden, tender, flavorful, delicious. This is one of the best chicken dishes I have ever tasted. I make these grilled chicken thighs all summer long and everyone at the table is always thrilled to have them. I especially love this recipe for when I’m entertaining or feeding a crowd because the prep is easy and you can do it all ahead of time. The real magic of this recipe is in the yogurt marinade. Yogurt is an ideal marinade base for beef and poultry. Any dairy – yogurt , milk, buttermilk – is an excellent tenderizer, partly because it is not very acidic. Acidic marinades can actually toughen meat. According to Fine Cooking contributor Shirley Corriher, dairy products are the only marinades that truly tenderize. She goes on to explain that calcium seems to activate enzymes in the meat, causing the proteins to break down. I have to assume all that “breaking-down” makes way for the delicious flavors of pepper, lemon, and garlic to move in. 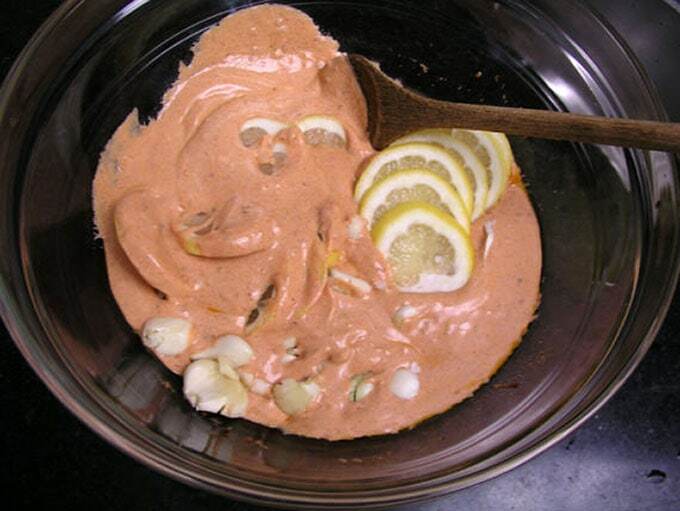 The marinade is a mix of yogurt, sliced lemons, smashed garlic cloves, tomato paste, vinegar, olive oil and spices. Mix it all together with the chicken and let it sit in the fridge for at least an hour. Aleppo Pepper is a wonderful spice. I discovered it on a trip to Istanbul and I fell I love with it. It’s fruity with a moderate level of heat, not as hot as crushed red pepper flakes and way more flavorful. 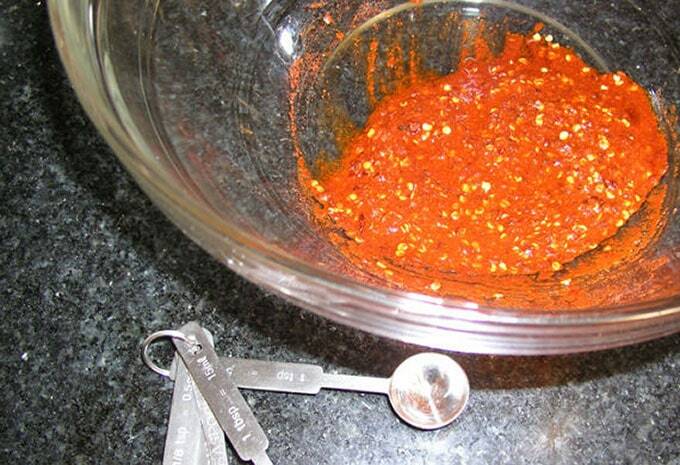 If you can’t find aleppo pepper, mix up equal amounts of crushed red pepper flakes and sweet paprika. I’ve done this on several occasion and the result is still the best grilled chicken thighs ever! Flattening garlic is a really easy way to get the skin off. Using one hand, hold the clove down against the cutting board with the flat side of a broad knife. 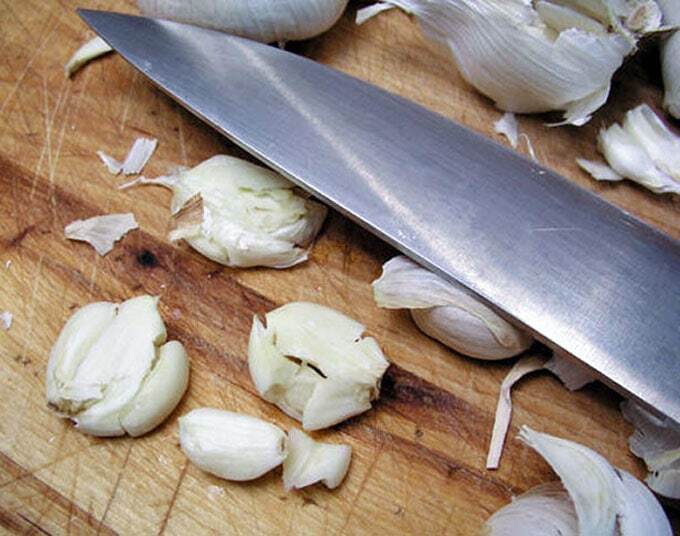 With the heel of your other hand, pound the knife, crunching down on the garlic. When you lift the knife the skin on the clove will be loose and you can just pull it off. The Turks are credited with bringing yogurt to the world. The word “yogurt” comes from the Turkish word “Yogurt.” The invention of yogurt likely came about by chance, many centuries ago, in the process of trying to figure out how to store dairy products. Yogurt has always been an important ingredient in Turkish cuisine. Turkish BBQ often involves threading the meat on a skewer before grilling – the kebab – and serving it with rice. Part of my love for this recipe is the ease of preparing it but if you want a more authentic presentation, you can cut the chicken and thread it onto skewers before grilling. Preheat the barbecue to medium-high heat. Rub oil over the grates. Remove the chicken from the marinade and sprinkle with salt and pepper. Grill for about 6 minutes per side. 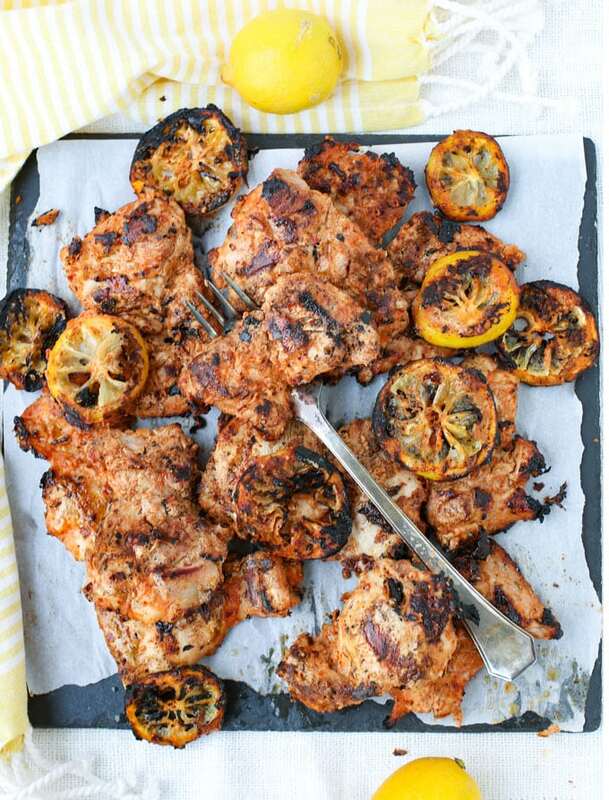 Enjoy these amazing grilled chicken thighs and don’t forget to serve the grilled lemons and garlic alongside. They are delicious! Here’s the recipe for Aleppo Pepper Chicken. If you try this recipe I hope you’ll come back to leave a star rating and a comment. I’d love to know what you think! The most tender and delicious grilled chicken thighs. Very easy and always a huge crowd pleaser. 2 unpeeled lemons, sliced into thin rounds. Add the next six ingredients to the bowl: Yogurt, oil, vinegar, tomato paste, salt, and pepper. Stir thoroughly to combine. Next mix in the garlic and lemon slices. Add the chicken and stir to fully combine all ingredients. Preheat the barbecue to medium-high heat. Rub oil over the grates. Sprinkle chicken with salt and pepper. Grill the chicken about 6 minutes per side, or until cooked through. Serve with grilled lemons and garlic. Enjoy! I was wondering whether you could use this recipe with chicken wings? I bet that they would be delicious! I’ve never tried this with wings. I’m sure the marinade would be delicious! Lori & Ty brought all the ingredients for this dish to Friendship, Maine and cooked this AMAZING chicken for us last night. DELICIOUS, totally Delicious……I’m going to check out the rest of your recipes this afternoon while it rains and will continue to get to know you through your recipes! Hi Karen – Great to hear from you! I hope you and Lori & Ty had a fun weekend together in Friendship. Lori mentioned she was bringing Aleppo chicken. I’m so glad you enjoyed it – It’s a big favorite at our house. I make it all summer long and I always make extra for salads or wraps. Great to meet you here on the blog – hopefully sometime in person. Boy this is a good one! Loved it! This was the best chicken I’ve had all summer!! I’m just learning how to grill and it was very forgiving. Went to world market to get some san marzano canned tomatoes. I noticed aleppo pepper there. I bought some and knew you must have a recipe. Trying this one soon! Lucky you to find Aleppo. It’s scarce these days. I hope you enjoy the chicken. Let me know. Is it possible to make that recipe in the oven or under a broiler? Absolutely! I think they’d be delicious broiled. You probably only need to broil them for about 5 minutes per side since they’re boneless. Try that and if they’re not quite done, put them back in for another minute or two. Let me know how the turn out! I am thinking of making chicken thighs with bone that way, so I guess it would take longer. Thank you! We tried this yesterday, and enjoyed it very much! As has been said, the yogurt does an amazing job of keeping the chicken moist and tender. The combination of the Aleppo pepper and the lemons is simply outstanding. Thank you for sharing it, and please keep up the great work! Making this recipe again tonight. I’ve probably made this at least a dozen times since Lisa posted it. Going to make it with her carrot salad as well which is another all time favorite. The yogurt in this recipe makes the chicken so tender and the flavors of Aleppo and the lemons with garlic are outstanding. What is Aleppo pepper? Is there a substitute? Aleppo pepper is a delicious red pepper from Aleppo Syria – near Turkey. If you can’t find it you can substitute equal amounts of sweet paprika and crushed red pepper flakes. This recipe looks great, but they sure don’t help when I have people over to dinner who keep Kosher. Any suggestions? The yogurt obviously is a problem to use. Thanks in advance for a response. This was fantastic, one of my new and favorite meals. It was so easy to make and the chicken comes out incredibly moist…loved the grilled lemons and garlic too! I made this last night. So simple to make and so delicious. I found Aleppo pepper at Penzey Spice in Arlington, MA. Hi Michael. Thanks for reporting back – “so simple and so delicious” is why I make this frequently! Glad to see the site running smoothly. Congratulations! This looks delicious. I make a simpler version with just chicken cut up into bitesize pieces, greek yogurt, garlic sliced, lemon juice and turmeric. Stir fry or broiled, it is an easy dinner. In classic Lisa style, you have created a visually appealing, informative, beautiful, interesting and really useful blog. I’m syked!!!! This is the best recipe. Thanks Lisa. I use this basic marinade for lamb as well. It’s so moist and delicious. Yes! Sorry I don’t have the recipe up yet, but I promise I will soon.